When reading either of its two versions, from 1964 and 1999, they could be seen as an extreme case of professional navel-gazing and of no relevance outside of the design community. But a planned update of the manifesto for 2014 is determined to engage a wider audience in the debate about graphic design’s relationship with life and society. First written and published in 1964 by designer Ken Garland (see Eye 66), ‘First Things First’ questioned the primary focus of graphic design that had become dominated by commercial work. It asked why designers’ time and services could not be put to better use for wider societal gain, citing education and cultural sectors as key areas that could benefit from designers’ skills. Signed by 22 practitioners of the day, the manifesto had Modernist ideology at its core. 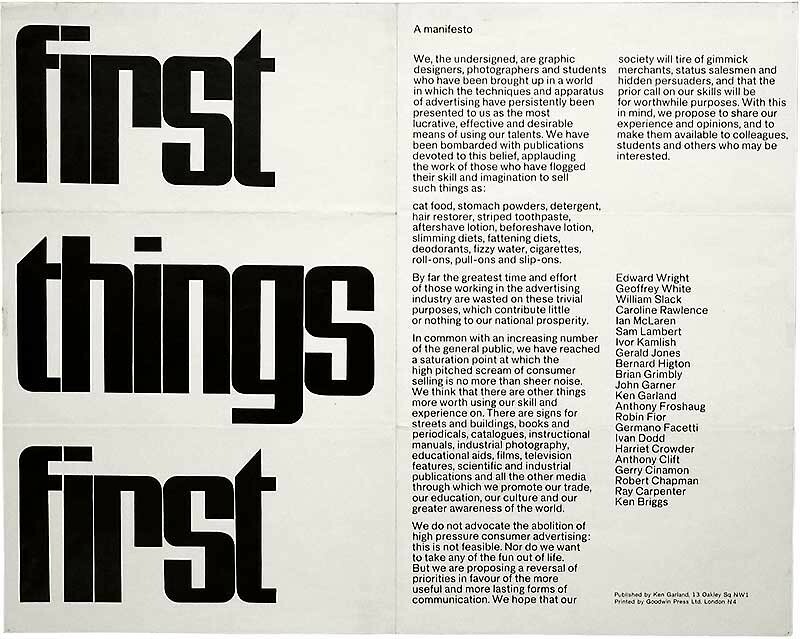 On the eve of the 1964 manifesto’s 50th anniversary, in March 2014, designer Cole Peters has decided it is time to renew ‘First Things First’ once again. 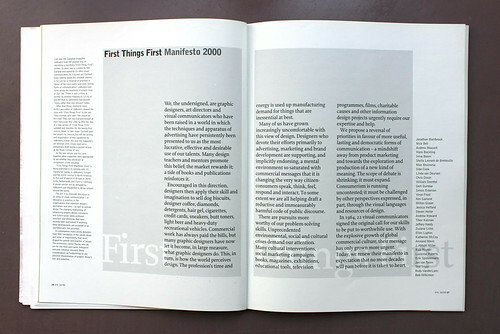 Peters first came across both the 1964 and 1999 versions in Manifesto, a small print-run book published in 2010 by Manifesto Project to coincide with an exhibition of design texts. Peters says of the discovery: ‘At the time, I was working as an in-house advertising director for a Canadian retail company, struggling with my increasing distaste for the work I was doing and questioning how I could do something more meaningful; the work was interesting for me … but at the end of the day, it bothered me that it was only truly beneficial in a corporate, profit-centric sense.’ Reading ‘First Things First’ had such an impact on Peters that when he went on to co-found the studio Burdocks in Canada, the studio’s first project was for a non-profit architectural and public education organisation. ‘First Things First 2014’ will undoubtedly get given a tough time from many quarters, just as the 2000 version did. In his 2001 book Obey The Giant, Rick Poynor reported: ‘Naive. Elitist. Arrogant. Hypocritical. Pompous. Outdated. Cynically exploitative. Flawed. Rigid. Unimaginative. Pathetic … These are just a few of the barbs and catcalls hurled at the 400 word text and its signatories by individuals who may have rejected its every line and sentiment, but apparently felt sufficiently rattled by its arrival to fire off a public response.’ Poynor went on to say: ‘In fifteen years as a design writer, I have never observed anything in the design press to compare with the scale, intensity and duration of international reaction to “First Things First”.’ And that was in the days before website comment sections promoted ‘open journalism’ and before social media. While non-designers may see the FTF manifesto as overly introspective and of no importance to them, I would proffer this thought to anyone outside the creative sector to consider. Imagine if other professions decided to initiate their own ‘First Things First’ manifesto – Members of Parliament, the banking industry, newspaper proprietors or payday loan vendors? If the design community can engage in open and public critical self-reflection, then why not other professions? Could action of this kind realign priorities for the benefit of all of society? Maybe it would, maybe it wouldn’t; but one thing is for sure, it wouldn’t look like navel-gazing – it would look like a healthy discourse on the nature of our contemporary society and the responsibilities we all have towards it. And for that reason I say all power to ‘First Things First 2014’. Where do I sign? ‘First Things First Manifesto 2000’ spread in Eye no. 33 vol. 9, 1999. Design: Nick Bell. Top: ‘First Things First’ manifesto, 1964. Design: Ken Garland.